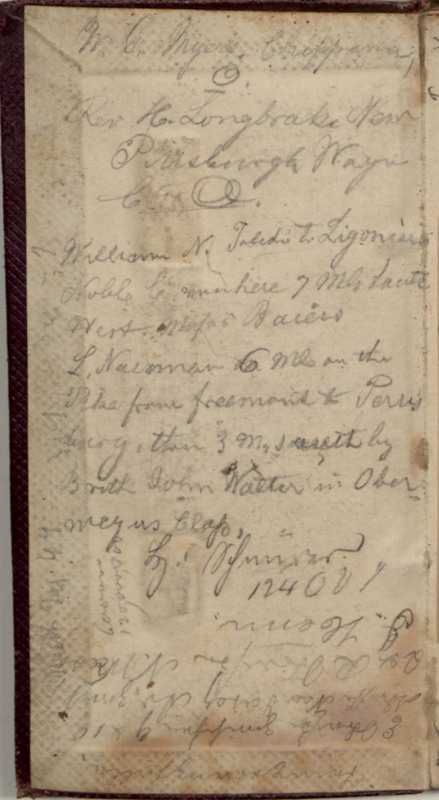 W. C. Myers, Chippewa, O. Rev H Longbrake New Pitsborough Wayne Co. O. William N. Toledo to Ligoniers Noble [Co annan?] here 7 Mls. south West [Moss to Baiers?] L. Nauman 6 Mls on the PIke from freemont to [Perris way? ], then 3 Ms south by Broth John Walter In Oberney us Class, [M. Hunrar?] 124 O V I (Upside-down, at bottom of page:-) E John B [guns firing?] 9 & 10 W H Ness [Janey?]Av. 2m Q & R Johnsson N.West J. Henn. (Vertically, at lower left:-) [?